I’m a quarter of the way through “The Reagan Diaries” by historian Douglas Brinkley. One of my first impressions is, this book is big – nearly 700 pages before the footnotes begin. The diary is edited by Brinkley but there are still tons of pay dirt to sift through for valuable nuggets. Reagan was a very good writer. His skills at expressing his thoughts are surprising, although it shouldn't be a surprise, considering his years of writing radio commentary in the 1970s plus writing and delivering lots of speeches. 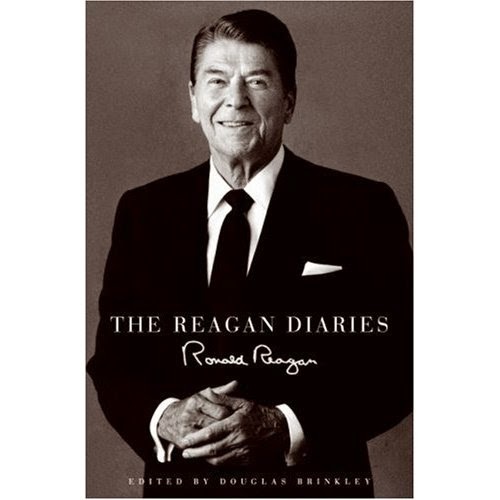 Reagan was also a disciplined writer, making diary entries almost every day. 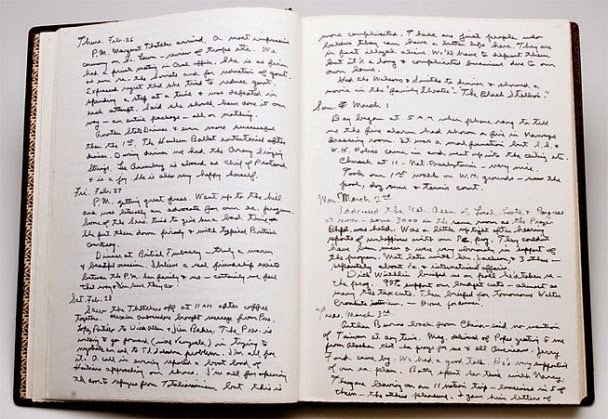 The diaries touch on big issues (the Cold War and the communists, the Nuclear Freeze movement, freedom, taxes) as well as smaller issues (missing his wife when they were separated, his frustration with Ron for wanting to ditch Secret Service protection, the phone calls he made – lots of them – to public servants who died in the line of duty). Below is a photo of one of the diary books Reagan wrote in during his presidency. I’ll write a full review once I finish the book.